If you are looking for a weekly class schedule, Click Here! Our Group classes are small so we do suggest signing up ahead of time if you have a chance! Drop ins are welcome as long as there is space in class! Pilates Mat, Yoga, and Barre Classes are limited to 10 participants maximum. 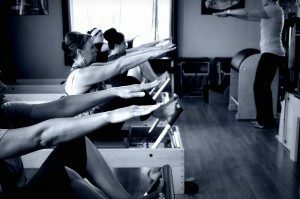 Pilates Tower classes are limited to 6 participants and Pilates Reformer classes are limited to 4 participants. Group class cards can be used for Pilates mat classes, Yoga classes, Barre classes, strength training classes, wellness classes and Pilates equipment classes. Pilates Equipment classes use 2 credits and all other classes use 1 class credit. Class cards are good for 6 months past the purchase date. Make a commitment to your health and save money! Ask about our monthly class options and save big on class prices!! Monthly Members receive priority scheduling, a free health coaching session, discounts on studio workshops, discounts on retail purchases and more!! !